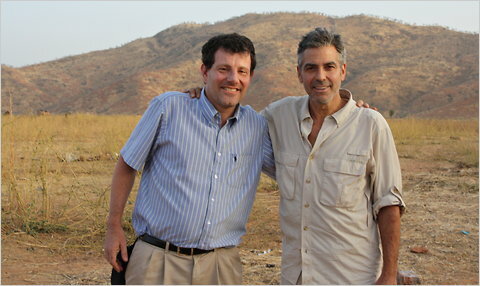 My former travel buddy, George Clooney, caught malaria in January on a trip to Sudan (see what happens when I’m not around to look out for him?). This seemed an opportunity to shine a spotlight on malaria, one of the scourges of much of the developing world, and George agreed to respond to reader questions. Thanks to all for submitting your questions–and I’m truly sorry that the answers were delayed. We were about to post these answers when Egypt intervened and I was too busy dodging pro-Mubarak thugs in Cairo to focus on this. So without further ado, George and I are finally responding. Nicholas D. Kristof/The New York Times Nicholas Kristof and George Clooney in Chad in 2009. I am wondering how Mr Clooney is feeling. I had a friend with malaria who was very, very ill!! I’m feeling much better thank you. What side effects did you have? And what were your symptoms when malaria was detected? Not much in side effects, the symptoms are fever, the chills, and exciting adventures in the toilet..weak..really just very bad flu conditions with a little food poisoning thrown in to make you the perfect party guest. Was Mr. Clooney taking any medications for malaria prophylaxis? And if so, how faithfully was he taking them? I hope he visited a travel medicine specialist prior to his trip! I don’t know about George, but I wasn’t taking malaria pills when I caught malaria in Congo in 1997. I learned my lesson and now usually take Larium when going to a malarial place in Africa. But some people don’t react well to Larium, and so I sometimes steer others toward Malarone. About five Americans die a year from malaria, usually after travel to the developing world, so it’s worth taking it seriously — and seeking treatment immediately if you develop the symptoms after such a trip. George – A dear friend of mine had malaria…does it recur? And if you’ve had it once, can you get it again? It can…it depends on what type you get..i didn’t get that strain thankfully. George – How did your treatment for malaria differ from the treatment that the average Sudanese would receive? I had drugs to take before during and after…pills that should be just provided to these people, like a polio vaccine..life saving drugs for diseases that kill millions needlessly, belong to mankind not to companies to profit from….we need another Jonas Salk. The average Sudanese in rural areas might not receive any treatment for malaria at all. In rural Africa, any fever is regarded as malaria, and people just suffer and usually recover; there seems to be a certain amount of resistance that builds up among healthy adults. So many people suffer malaria many, many times. Children and pregnant women are particularly vulnerable to dying from it, while healthy adults normally survive, although it can be lethal for them as well. Longlasting insecticidal nets yielded an important breakthrough in malaria prevention, but this does not automatically mean they always work against diseases transmitted by insect bites. Against the transmission of kala azar disease in India and Nepal they did not have an effect. This was reported by an international group of researchers, led by Marleen Boelaert of the Institute of Tropical Medicine Antwerp, in the reputed British Medical Journal. Kala-azar, or visceral leishmaniasis in doctor’s speak, affects half a million people annually. The Leshmania parasite, in fact a group of related parasites, is transmitted by sand flies. The parasite destroys your blood cells, leading to an enlarged spleen, inflammation and progressive wasting. If left untreated, the outcome is fatal. Until now, in India and Nepal sand flies are controlled by indoor spraying of DDT or other insecticides; some families use classical mosquito nets, which are not treated with longlasting insecticides. Spraying happens local and irregular, which means at any moment sufficient sand flies and prey remain to continue the disease. As an alternative for DDT, a large scale campaign was proposed, providing everyone in a region with a mosquito net treated with insecticide that remains active for several years. Hypophosphatasia – What is Hypophosphatasia? Herpes Labialis – What is Herpes Labialis? The number of cases of a potentially fatal parasitic disease has increased six-fold in southern Sudan. Visceral leismaniasis- also known as kala-azar – is the most severe form of the disease. More than 6,000 people have been infected and over 300 have died in the last year. The World Health Organization and the Sudanese ministry of health are leading the distribution of treatments and testing equipment to affected areas. Visceral leishmaniasis is caused by the Leishmania parasite and transmitted via the bite of an infected sand fly. It is the most dangerous form of the disease because the parasite migrates into the spleen and liver. It causes high fever, significant weight loss, enlargement of the spleen and liver, and anaemia. If left untreated visceral leishmaniasis is nearly always fatal. The number of cases from September 2009 until now is more than six times higher than in 2007-08. The counties of Old Fangak and Ayod in the south of the country are particularly affected. Dr Abdi Aden, head of the WHO’s office for Southern Sudan said “The increased number of cases in Old Fangak, Ayod and surrounding areas is very disturbing and it is becoming difficult to contain the outbreak. To keep responding to the outbreak over the next six months an additional $700,000 is needed. This will buy more treatments, diagnostic kits as well as food supplies. Kala-azar suppresses the immune system making patients vulnerable to other infections like pneumonia and malaria. Those that are malnourished are at particularly high risk of dying. The disease is difficult to treat – daily injections for a month are needed, so patients need to stay close to health facilities. But many patients still cannot reach treatment centres due to insecurity, flooding and distance. Dr Mounir Christo Lado of the Sudanese ministry of health said the kala-azar outbreak could worsen between now and next spring. Deltamethrin is the alternative pesticide to DDT. The datasheet shows that it is moderately hazardous, moderately toxic, there isn’t enough information to know how carcinogenic it might be, and it causes endocrine disruption.